There is nothing of which every man is so afraid as getting to know how enormously much he is capable of. Into this chaos three humans and one monster will learn exactly that as they are thrown together with only one goal: Save Rumania from the German war machine. Prince Vlad Tepes, better known as Dracula. Once ruler of the land again under siege, he fights to redeem himself for the sins he perpetrated against his people by driving out these new invaders as he did those others five hundred years before. Over them hangs an uneasy truce . . . between the doctor and the vampire, old foes now united in a common cause; between Dracula and Harker, both attracted to the same woman; between Jonathan, seduced by Lucy; and Lucy, regretting allowing a moment’s physical weakness to get in the way of her resolve not to care or to love. Both Jonathan and Lucy are also under the influence of The Book, that novel by Bram Stoker chronicling a specific chapter in the lives of Lucy’s father and Jonathan’s grandparents. Tantalized by it as children because no one would speak of what actually happened, they soon discover its contents erroneous in a great deal of its narration. They will succeed in a good portion of their mission, but the end will be nothing they expect. Purporting to be compiled from documents found in a government warehouse, Dracula vs. Hitler is more than a “horror” novel and anyone expecting merely bared fangs and gouts of blood may be disappointed. On the whole, it’s a war story, of people from disparate walks of life banding together for a common cause. Copying The Book’s original concept, it follows the multifocal point of view as related through the diaries of those involved. Well written and definitely descriptive—but what else would one expect from a screenwriter?—in several places it also pokes gentle fun at specific passages in Stoker’s novel. Dracula is portrayed as urbane and regal but teetering on the edge of losing control if the proper impetus appears. He speaks in short, terse sentences resembling epigrams. There is also a bit of tongue-in-cheekiness which a good many Draculophiles and/or horror novel readers will recognize in the names of some of the supporting characters, such as Sergeant Renfield, the gypsy Ouyspenkaya and his daughter Maleva, and Corporal Schrek. The ending is uncomfortably short in its brevity, and will doubtless leave the reader with many questions, the foremost of which is: Does this mean there’s a second novel continuing the story? Such would definitely be welcomed. 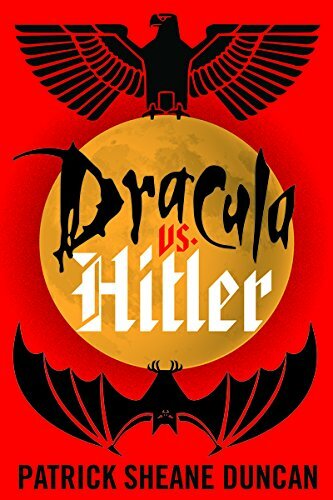 In spite of its rather sensation title, Dracula vs. Hitler is not so much a horror story as it is a chronicle of the war we’re all familiar with, but of that conflict in a portion of Europe of which the majority of the world is still unfamiliar. It’s a novel worthy of being called the true sequel to Bram Stoker’s Dracula, and Patrick Sheane Duncan a writer rightfully deserving to be considered that author’s successor.